Functions: 1. To reduce heat caused by deficient yin; 2. To clear heat in infants caused by malnutrition. 1. Heat signs due to deficiency of yin manifested as afternoon fever and night sweating. Stellaria root (Yinchaihu) is used with Turtle shell (Biejia), Sweet wormwood (Qinghao) and Wolfberry bark (Digupi) in the formula Qinggu San. 2. Infantile malnutrition manifested as swollen abdomen and emaciation. 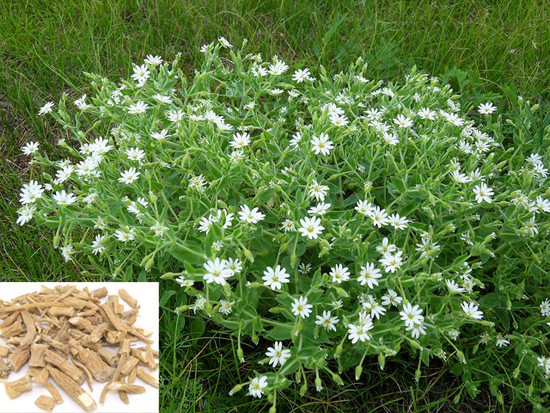 Stellaria root (Yinchaihu) is used with Pilose asiabell root (Dangshen), Capejasmine (Zhizi) and Scutellaria root (Huangqin) in the formula Chaihu Qinggan Tang. Cautions & Contraindications: This herb is contraindicated in fever due to invasion by exogenous pathogenic wind and cold, or in cases with deficient blood syndrome but no signs of heat.